"Ghostlike" sculptures of soldiers who died in World War One have been erected next to their graves in a village cemetery. The life-size figures of 11 men have been placed in Slimbridge churchyard in Gloucestershire. 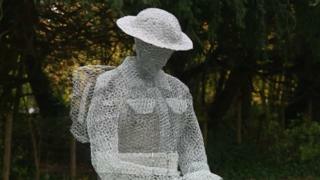 Sculptor Jackie Lantelli created them out of chicken wire to mark the 100th anniversary of the end of the war. Ms Lantelli said she had always been "passionate about remembering on Remembrance Day". "It's 100 years and I thought we ought to do something special," she said. She said the sculptures represent the 11 fallen soldiers from the village and have been placed at the foot of the men's graves. She added the display had caused people who have seen them to get "very emotional". "It's not just a name on a grave any more. You've got an actual physical thing, and it makes you think this was actually a person." Image caption The soldiers are made of chicken wire which makes them look "ghostlike"
Image caption Jackie Lantelli said the figures caused people to get "very emotional".